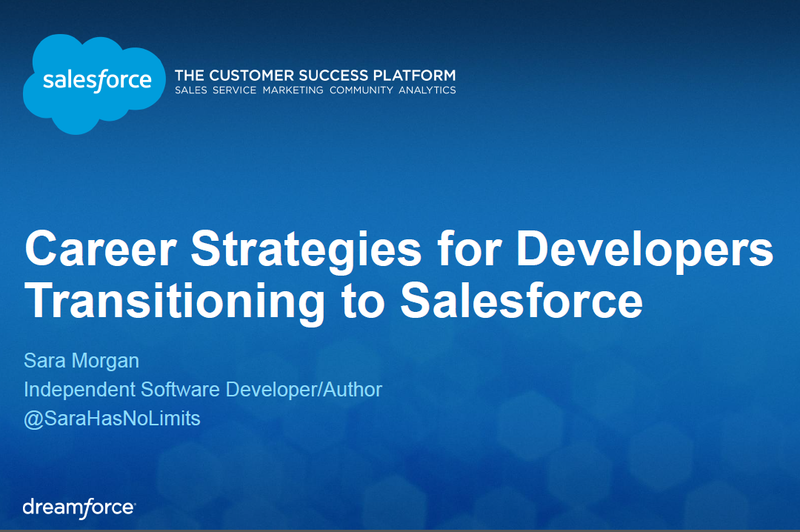 On Tuesday I had the honor of speaking at a Dreamforce 14 session titled, “Career Strategies for Developers Transitioning to Salesforce”. A few people at the session asked whether my slide deck would be made available and I promised them I would post it on my blog, so that is the main purpose for this post. If you are interested in the slides from my session, you can find them here. If you are interested in the other developers I interviewed to prepare for this session, then you can check them out here. I will be adding one each week. And if you came by the session, THANKS!!! Previous Developing with Visualforce Course just went Live!!! Really appreciated this session! I’m fairly new to SFDC and it was great hearing about your transition. Looking forward to learning more! Also very glad about your Visualforce course–I’ll definitely join Lynda for that.